The Ionia County Parks and Recreation Department oversees two county parks, as well as many miles of Rail-Trail projects. The County’s recreation related planning activities are undertaken by a Parks Advisory Board, which reports to the County’s Board of Commissioners. 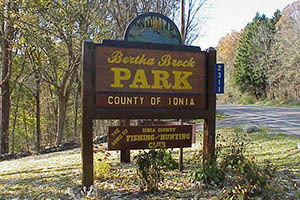 Bertha Brock Park is a 186 acre county park located two miles west of the City of Ionia on M-21. It is a regional park that serves the entire county and surrounding areas. Bertha Brock Park offers a campground, rental lodges, play areas, picnic shelters, hiking trails, sledding hill, and various family oriented recreational activities. Green View Point Park is a four acre County park located east of the Village of Lyons on Kimball Road. The park offers wonderful views of the Grand River several hundred feet below the park. 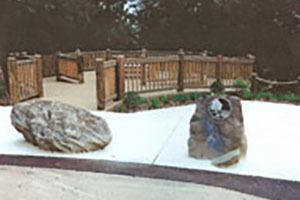 The park was named in honor of Governor Fred Green (elected in 1926), who used to stop at the site to enjoy the view. 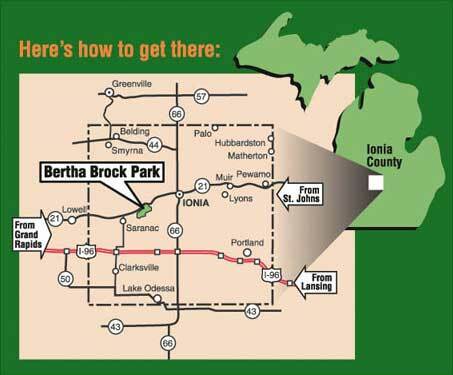 Ionia County is home to several miles of rail-trail corridor. In the eastern side of the county a 41.3 mile rail-trail will be developed along the old Central Michigan Railroad corridor, from the east edge of the City of Ionia traversing east through Clinton County and ending near the City of Owosso in Shiawassee County. Ionia County has established the importance of recreation to the County’s quality of life by developing a recreation plan. This plan represents the ideas of the County’s officials and residents through meetings, a public input prioritization workshop, and a public meeting to review a draft of the plan. The planning process was a combined effort of the Park Advisory Board, County Officials, and interested citizens. The plan focuses on all aspects of recreation in Ionia County. It was formally adopted by the Board of Commissioners on March 25, 2014. The County will work to renew its five-year recreation plan in 2018. Annual admission stickers are available at the Park Office for only $15 per year. The sticker allows your vehicle to enter the park as often as you wish during the year without paying the usual $2.00 entrance fee! These T-shirts are printed locally and come in a wide variety of colors! For only $10, they make a great souvenir of the park, and a reminder of the wonderful times you've had there. Ask for yours at the Park Office!